The lack of justice for victims of human rights abuses in El Salvador was the subject of hearings in Mexico City on Tuesday. The Inter-American Commission on Human Rights held two hearings this morning concerning El Salvador. The first hearing addressed reports of extra-judicial killings by security forces in El Salvador. The second hearing received reports on whether there had been any progress, following the nullification of the 1993 Amnesty Law, to address crimes against humanity committed during El Salvador's civil war. The petitioners complaining of extra-judicial killings were the Institute for Human Rights at the UCA (IDHUCA) and Passionist Social Services (SSPAS). They presented both individual cases and collective statistics on the existence of extra-judicial killings by security forces in El Salvador. Beyond the killings, the petitioners pointed to actions by security forces to manipulate crime scenes and the lack of any serious investigation or the collection of forensic evidence. Victims and witnesses are intimidated and re-victimized. Despite the numerous reports of such killings by elements of the police and armed forces, there have been no serious investigations, the petitioners contend. The reports in the second hearing, concerning what has transpired after the Amnesty Law was repealed, were provided by a broad coalition of human rights groups in El Salvador. While applauding the recent creation of a commission to search for persons still missing from the civil war, the groups denounced the lack of progress in any judicial proceedings against those responsible for crimes against humanity. Only the case of El Mozote has had any progress, and that progress was only through the efforts of lawyers for the victims while the Attorney General has been completely passive. In addition, the human rights groups voiced their concerns that the armed forces had still not opened their archives and that records were being destroyed. 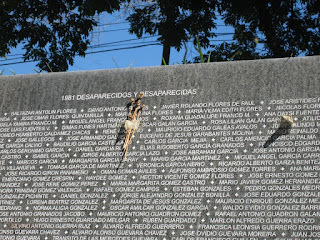 The government spent most of its time talking about events which happened before the repeal of the Amnesty Law, starting with Mauricio Funes in 2009-2010 asking forgiveness on the part of the Salvadoran government for its role in the El Mozote massacre and other atrocities during the war. The government said it had been working since then on programs for indemnification of victims. It touted its earlier creation of a commission to search for children abducted during the war (after being ordered to do so by the Inter-American Court for Human Rights) and its recent creation of the commission to search for persons who are still missing. The government pointed to the commitment of the president of the National Assembly to introduce legislation on transitional justice (even though nothing is yet making its way through the legislature) and the the creation by the Attorney General of a unit which is receiving specialized training in human rights cases (although such cases are not yet being pursued). The scheduling of these hearings back to back by the IACHR, whether intentional or not, makes an important point. Human rights have never received a commitment from governments past and present in El Salvador. When government actors violate human rights in El Salvador -- from the time of the civil war (and earlier) until the present, their crimes almost always remain in impunity. The human rights groups presenting their cases before the IACHR this morning sponsored a simulcast viewing of the hearings in San Salvador followed by a panel discussion. One of the panelists, Sol Yáñez, a psychologist specializing in psycho-social traumas stated, "Impunity for the past is intimately linked to the events and impunity of the present." It is an important point. The failure of the country to address the human rights abuses of its past, including crimes from the assassination of Oscar Romero to the massacres of thousands, is one of the root causes of the country's current violence and lack of a culture of respect for human rights. Just as in the civil war, where the government denied the existence of massacres, the government now is denying its forces engage in extra-judicial executions. Just as in the civil war and following there has been impunity for those who violated human rights, there is impunity today for security forces involved in human rights violations. Just as in the civil war, where victims received no acknowledgement or support from the Salvadoran government, the victims of state mistreatment and victims of gang violence receive scarcely any support from the state. Just as in the civil war, thousands of families have loved ones who have disappeared, suffering ongoing anguish. Tuesday's hearings, which were conducted in Spanish are available for viewing on YouTube. Hearing on extra-judicial killings video. Hearing on developments after repeal of Amnesty Law video.